Dan Mullan/Getty ImagesMexico has made it out of the group stage at the previous six World Cups, only to be eliminated in the first game of the knockout round year after year, but after El Tri’s shocking upset win over Germany, this could be the year they break the spell. Mexico defeated Germany 1-0 in one of the wildest results of the opening weekend of the 2018 World Cup. With the win, Mexico takes pole position to win Group F, which should help to set the team up with a favourable matchup in the knockout stage. The difference between winning the group and escaping it in second place is enormous, as it could mean that the team avoids Brazil in the round of 16 and provides a path to make the quarterfinal for the first time since 1986. The 2018 World Cup has already had its fair share of shocking results, with Cristiano Ronaldo playing hero for Portugal and Iceland forcing a hard-fought draw against Lionel Messi and Argentina. But the most impressive result so far is likely Mexico’s upset 1-0 win over defending World Cup champions Germany on Sunday. Mexico earned the three points despite holding just 39% possession thanks to a stifling defensive effort, and aggressive counter-attack, and a brilliant performance from goalkeeper Guillermo Ochoa. In the 35th minute, one counter attack broke through, with Chicarito sending a through ball to teammate Chucky Lozano to give Mexico a 1-0 lead that would hold for the match. The win was huge for Mexico, not just for its historical context – it’s the first time any CONCACAF squad has defeated the Germans at the World Cup – but also for Mexico’s chances of breaking one of the most brutal streaks in the tournament. Mexico has escaped the group stage of six straight World Cups, only to lose in their first knockout stage match every time. The team has a knack for offering a glimmer of hope for a run towards the semis, and then immediately stumbling once the tournament is down to 16 teams. This year, it looked as though the curse was set to repeat itself yet again – assuming Germany won Group F and with Brazil penciled in as the presumptive winners of Group E, Mexico would be paired with Brazil in the knockout stage and face yet another uphill battle to advance. But thanks to Mexico’s thrilling upset win, the script has flipped. Should Mexico be able to hold on and win the group, and assuming Brazil recovers from its surprising stumble of a draw against Switzerland, Mexico could escape to the knockout round with a much more favourable matchup, and potentially finally break through to the quarterfinals for the first time since 1986. There’s still a long way to go before the group stage is settled, and there’s a chance that Mexico wins its group and still winds up playing Brazil in the knockout stage. 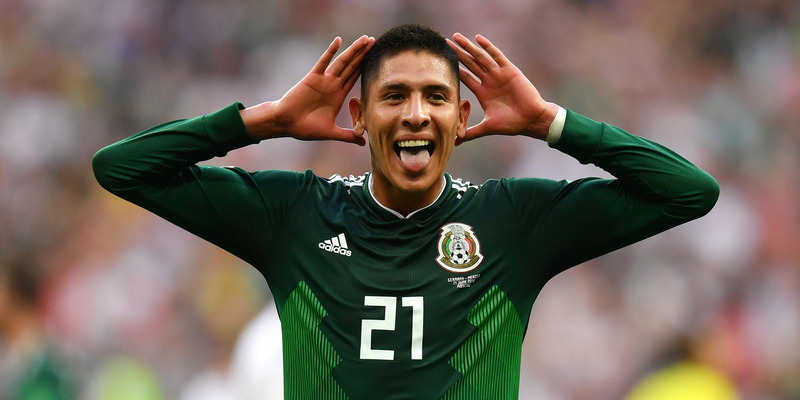 But with the win over Germany, El Tri has officially put the world on notice – the counter-attack that secured the game-winning goal and provided numerous other scoring opportunities is a style that can take down even the best squads on the planet. If Mexico can stay sharp and win the group, this could be the year they finally break through.